Jordan Wolf Voice was planning to leave early this morning for his second trip to join the pipeline protesters in North Dakota. Wolf Voice is a 27-year-old Northern Cheyenne and Lakota. He has lived in Laurel his whole life and he works in the deli at Lucky’s Market in Billings. In late November, he spent three days at the protest against the Dakota Access pipeline, just outside the Standing Rock Sioux Reservation, and he’s going back for three more days out of a sense of obligation. The thousands of protesters at the huge protest camp have been ordered by the U.S. Army Corps of Engineers and the governor of North Dakota to leave the camp by Monday. Wolf Voice was worried about being hurt or arrested on his first trip to Standing Rock and he’s still “pretty nervous” about his second visit, but he wants to be there as a show of solidarity with the Standing Rock Sioux and representatives of hundreds of other tribes gathered there. Wolf Voice was given up for adoption at birth and was taken in by a white couple in Laurel. 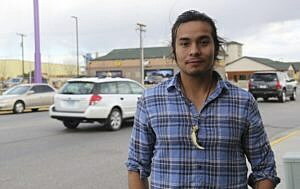 He said he was grateful for his upbringing and glad he was raised in Laurel, given all the despair and poverty on the Northern Cheyenne Reservation, but in the past year and a half or so he has been making a conscious effort to reconnect with his Native heritage. He started by changing his last name. It used to be Giles, for the first husband of his biological mother, so he changed it to Wolf Voice. He said he is inspired by memories of his grandfather, Lee Lone Bear, who died four years ago. He was a member of the Dog Soldier Society, a respected tribal elder and a shaman, Wolf Voice said, and from him he received his Cheyenne name, Elk Stands Alone. His grandfather used to make the long drive from Lame Deer to Laurel to watch Wolf Voice play basketball in high school, and he always encouraged his grandson. Wolf Voice said he has come to realize that his mindset, his way of looking at the world, was inherited from his grandfather. He’s convinced it is in his blood. He’s been through some terrible times, much of it related to drinking, to the point where he contemplated suicide a few years ago. That urge to help other people, to be a peacemaker, is related to what’s happening in the larger society, too. “This is such a weird, scary, crazy time in our country right now,” he said, and sometimes it seems like everybody is furiously angry for one reason or another. He saw a few displays of anger at Standing Rock, he said, but he told other protesters not to aim their anger at law enforcement, people who had no desire to be out on the freezing prairies of North Dakota. Mostly what he felt was positive, especially being around Native people from all over the country. 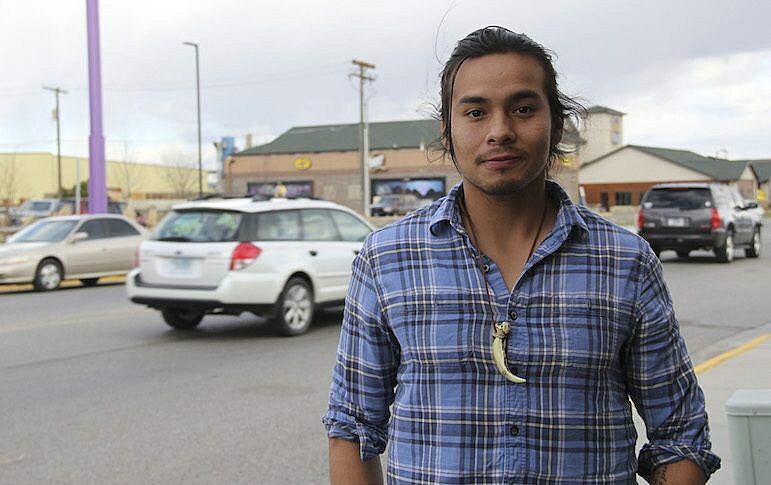 During his first three days at Standing Rock, he spent most of his time just walking from one end of the camp to the other and to different protest sites, meeting people, listening to stories and taking photos with his phone. Most of his friends in Laurel are more conservative than he is, and most of them, thankful for the jobs provided by the CHS refinery there, think the protest against the pipeline is just wrong. He’s also bringing material help, having rounded up hats, socks, body warmers, blankets and other supplies. He’ll be driving over alone, in his Ford Explorer, staying again at Cheyenne Camp, where on the last trip he ran into his biological father and his father’s best friend. The protest is something that has to be done, in his view. This article originally appeared at Last Best News, of which Ed Kemmick is the founding editor.